Something special is on the rise in the heart of the city’s core. Steps from the waterfront. At the intersection of everything the downtown scene has to offer. Ten York is rising above it all. This iconic condominium residence will soar 735 feet and change the Toronto skyline forever. Blending warm sophistication and modern design, the Ten York Signature Collection is ideally located in the uppermost floors of this landmark residence by Tridel. Whether you’re hosting friends in your sprawling living room or cooking a gourmet meal for family in your chef-inspired kitchen, the design of the Ten York Signature Collection enhances every moment. Access your suite through the key-fob activated elevators that quickly transport you to your Signature suite. 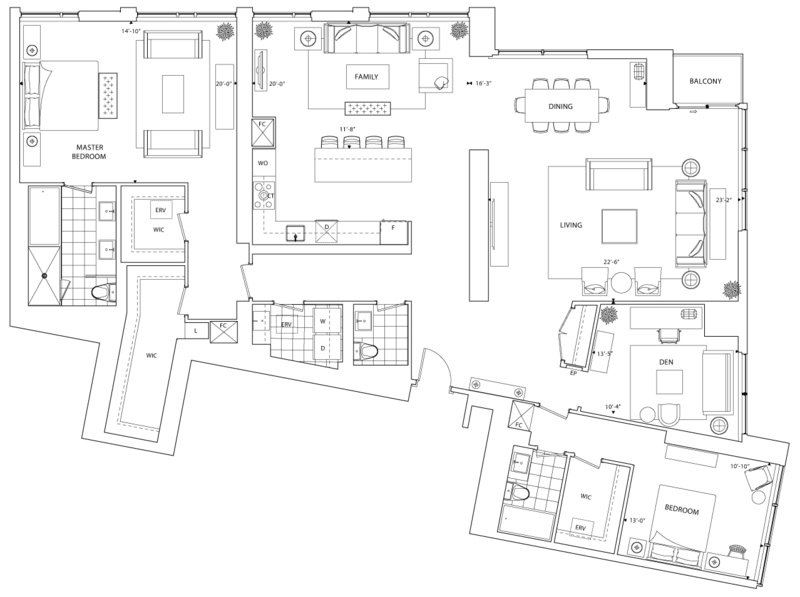 Offering unparalleled vistas of the water and city, these penthouses offer no more than six suites per floor. When you enter your home – unwind in spacious luxury with 10’ ceilings and plank-engineered wood flooring, where each day begins and ends in absolute indulgence. 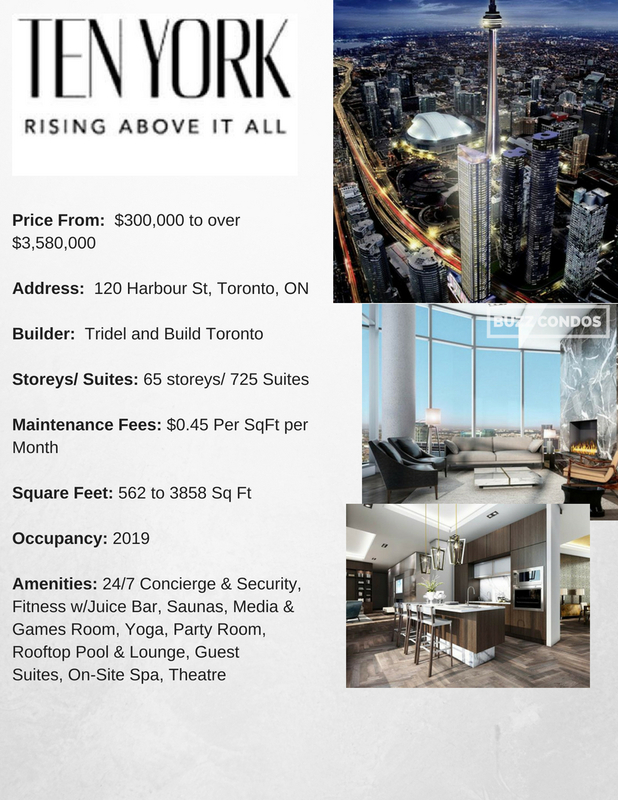 Condo Condominium From 8'6" to 9'0"
The Shore Club at TEN YORK offers luxurious lifestyle amenities that rival some of the world’s finest hotels. Relax by the pool, rejuvenate yourself in our spa, and rehydrate at our juice bar. Pump it up in the fully equipped spin studio and cardio room with panoramic vistas of the city. Buff it up in the weight room and admire the results you see reflected in the floor-to-ceiling mirrors. Retreat to the Yoga studio and activate your chakras. 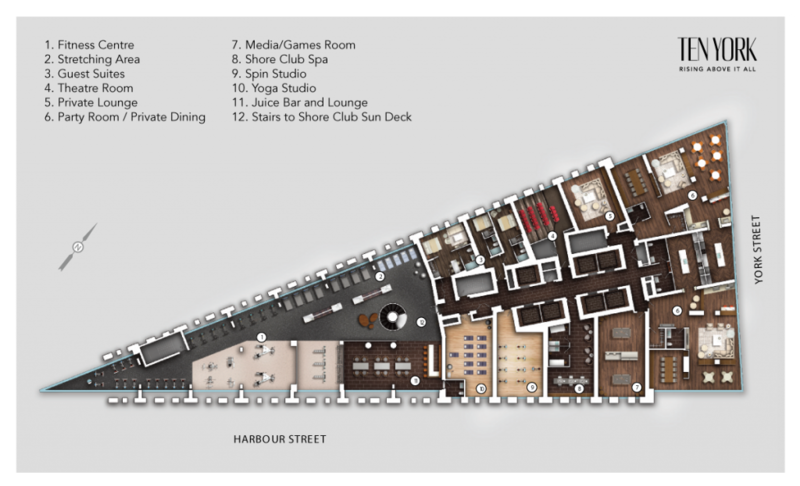 For entertainment, grab your game-controller and make your move in the Games & Media Room. Rack and break and take your billiards game up a notch in the club-inspired Billiards Room. Life at TEN YORK will exceed your expectations on every level. Stacked white front-loading dryer and Energy Star® high efficiency front-loading washer 16 Individual metering of electricity, hot water, space heating and cooling. Individual metering of electricity, hot water, space heating and cooling. Exclusive elevator access (key fob access only). 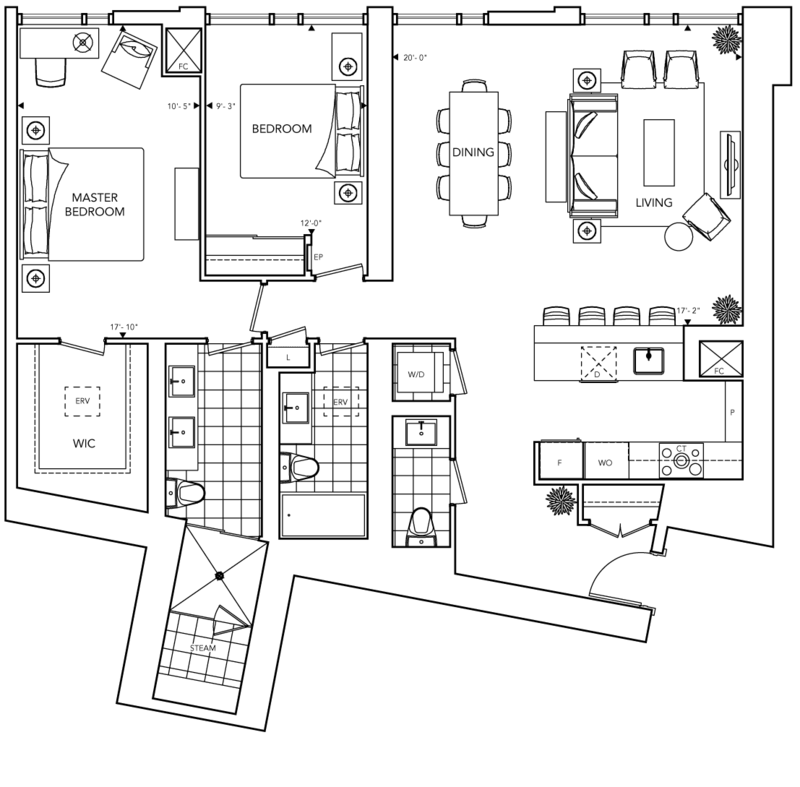 A leader in condominium living for over 80 years, and their founders redefined what “home” is. While being passionate about building condos, their story is about much more than what they build. tridel started over five decades ago is now recognized as the most innovative, sustainable concept in building new homes and communities. "Your life. Our promise to you is a simple but powerful reflection of our trademark, Built for Life. This means building homes of enduring, lasting value for today’s lifestyles." Hundreds of restaurants, bistros, clubs and cafés line the streets in all directions around TEN YORK. Check out Broadway-style productions at the Royal Alex Theatre, orchestra at Roy Thomson Hall and opera at the Four Seasons Centre for the Performing Arts. Catch celebrated films at TIFF Bell Lightbox or the Scotiabank Theatre. Enjoy the convenience of four major supermarkets and the freshest produce at St. Lawrence Market. You’re also only minutes away from cheering on Toronto’s multiple major sports franchises. TEN YORK is right in the middle of all the action. See Walkscore – 100% Transit Score®!